This Year’s Resolution: Use Less Plastic…Take Two! If you’ve been reading my blog for a while, you know that I firmly believe our actions in the kitchen have an impact on Mother Earth. There are so many things each of us can do every day with what and how we eat that can make a big difference in the environment. It’s empowering! Each year I choose a new year’s resolution to support those beliefs. Last year I decided our family needed to use less plastic and disposable items. I wrote a thorough post about the goal, with some information explaining what inspired my goal. And then, well, then life happened. And not much changed. And I didn’t reach my goal. This is not to say that we are over-users of plastic and disposables. I have always tried to be thoughtful about that. But things didn’t get any better than they were in the past. As I look back on 2012 I can honestly say that using less plastic and less disposable items is the hardest Eat Well, Heal the Planet goal I’ve made so far. Eating less meat was way easier than I thought it would be. Joining a CSA was a fabulous way to get our family eating more veggies and eating more locally. But less plastic? Less disposables? Oh my, it’s hard to do, especially in this throw-away, fast-paced society in which we live. It really takes effort. And I didn’t put in the effort I needed to. Instead of giving up and abandoning the goal, I’m going to give it another try! And I’m going to start with just a few specific goals and build from there. We have a lot of paper napkins on hand in our house. Last year I had visions of using cloth napkins, which we did TWICE. Yes, just two times. Here’s the plan for this year. Use up all the paper napkins that we have already. While we work through that supply, I will build up my cloth napkin stores. I am NOT going to buy more paper napkins for our daily use. Once they’re gone, it’s cloth all the way! I need to use less plastic baggies in my kids’ lunches. By the time school starts in the fall, I want to have transitioned to reusable metal containers, BPA- and pthalate-free plastic containers, and cloth pouches. I’m giving myself 9 months to make that transition happen. I am going to find and try various snack recipes to replace the snacks I buy at the store…you know, applesauce pouches, granola bars, fruit roll-ups, etc. I’m not going to expect myself to give up those convenient snacks cold turkey, but I want to try to find a realistic way to try to replace some or all of them by making those snacks myself. That’s it for now. I’ll make more small goals as the year moves on and I will let you know what they are and how my progress goes. I’m curious, did any of you try to cut back on plastic and disposables last year? How did it go? Any great tricks you can share from your journey? I am very interested to hear your feedback and about your experience! Here’s to a more successful 2013, filled with less plastic and lots of pretty cloth napkins! if you buy cloth/canvas pouches, be sure to buy ones that are lined with vinyl or something like that. i bought some all-cloth ones that i don’t really use for food because anything crisp gets soggy overnight in the fridge, and anything with moisture (fruits, veggies) makes the bag wet. i use the bags occasionally for things like muffins, but more often for other little things around the house, for traveling, etc. there are a lot of cute ones on etsy! Our preschool asked us not to send plastic bags in the lunch box, so I bought these awesome reusable bags from a local company called Semilla: http://www.semillasnackbags.com/ A friend gave them out as a party favor (great idea!) and I ended up buying another once we lost that one. 🙂 They’re lined and are washable, I’ve been really happy with them. The cloth napkin idea is great! We use/used cloth diapers and wipes, don’t know why I never think to use cloth napkins. Our girls will think we are so fancy! I like that they have a zipper (no velcro to be noisy and also snag clothes in the laundry). I just throw them in the laundry with my regular stuff. I even put them in the dryer without a problem (they recommend line dry). Someone gave us a sandwich wrap that is supposed to open up into a placemat. Great idea, but terrible product. When I washed it in the washer, the fabric shrank, the velcro snagged, the plastic warped, I threw it to the landfill. I’ll stick with bags and definitely to items I can throw in the wash. I am not going to hand wash and have to take great care in something that holds peanut butter and jelly! I am always on a crusade against juice box pouches. They are for lunches only. I hide them so no one can find them and drink them. I have a group of kids that come over every week for an activity. They all have a plastic cup with their name on it on a sharpie. They go in the dishwasher. Parents take turns providing snacks and they always wanted to send the juice pouches, until I banned them. Water is better anyway! I think reducing the packaging is good for anything, and I try to make purchasing decisions based on the amount of packaging. However, I do send plastic baggies in my high schooler’s lunch. There’s just no way he’d use the reusable pouches. But I wrap the sandwich in waxed paper…I think that’s better? Sometimes it’s hard to know. I have made a concerted effort to stop disposable stuff for lunches. My daughter takes applesauce in a plastic, reusable container and I bought snack bags (from Old Navy, of all places) to reuse. I also found some perfectly sized reusable sandwich containers. I have not eliminated plastic, obviously, but almost everything is reusable! And it saves money too! My biggest problem is the lunch boxes are too small for all this stuff, but we are making it work. – I don’t use plastic bag in kids’ lunches and try to use them as infrequently as possible at home…currently we’re using re-usable plastic in kids’ lunches, but i just ordered stainless steel small containers for lunch boxes. We use a lot of glass to store leftovers, etc. in the kitchen. We don’t buy plastic water bottles and this year I am going to try to cut down some more on buying individually wrapped items. Plus I’ve found it’s cheaper to buy one big item (like Costco veggie sticks) and put it in reusable container for lunches. Switching to a reusable lunchbox was super easy, there are so many bento box style options out there, the hardest part is figuring out which one will work best for your needs….and some of them can by pricey initially. I also want to transition to fabric napkins and stop using paper towels this year, I am debating on whether to slowly buy them or make some — maybe I’ll do a little of both. In our efforts last year to cut out processed food, we naturally stopped buying so much prepackaged snacks. I made everything from homemade goldfish crackers to fruit leather/roll-ups. These things certainly take time to make, but in the end they always end up tasting better than the store bought options, they end up being cheaper most of the time, and there’s less waste. It’s a win-win! I love your goals, very doable! Growing up, we never used paper napkins, always cloth ones. I think my mom spent a couple bucks on material and spent a day sewing them herself. Any and all ideas for non-pre-packaged snacks are welcome. We bought Easy Lunch Boxes 2 yrs ago – best thing I ever did. They are plastic, BUT, reusable, bpa free, dishwasher safe, cooler bag is machine washable, and EASY for a preschooler to open. it fit all our requirements, and honestly, it’s an outstanding product. we now use them for everything…hiking/biking snacks, picnics, school/work lunches, snacks in the car, etc.. btw, 2 yrs later, my set is still going strong. no warping, no staining. We also switched to using wide mouth mason jars at home for leftovers, storage, freezing, etc.. trying to minimize the plastics in the house too. I NEVER buy convenience items. this is nothing new, there’s just too many sketchy ingredients in most of them, and my budget won’t allow for buying all organic snacks. so what’s a mom to do? make it. It takes time and planning, but i’ve never regretted making healthy snacks for my family. Hi Jessica- can you share some of the items that work well stored in mason jars? Have you found any particular food that does not work well when stored in a mason jar? I cannot seem to give up paper towels. 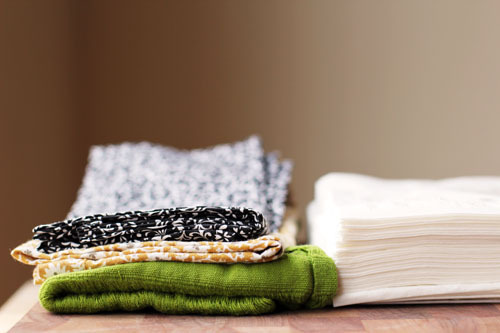 I think sponges and dish towels harbor bacteria and I am a BIG germaphobe! I enjoy cleaning the counters, stovetop, fridge handle, and sink each evening with fresh, disposable paper towels. I especially like cleaning up with paper towels as I chop and cook. Nothing seems to satisfy me as a substitute for a paper towel. We are really good at cloth napkins (It’s fun to get seasonal napkins too….adds to the “festive feel”) and don’t use many plastic bags. My hubby takes his lunch in glass containers…..usually leftovers from dinner. I use parchment paper to wrap sandwiches….but we don’t have the need to travel with sandwiches very often. I’m intrigued by mason jars…..I don’t currently use them, but may make that my 2013 resolution! I tried so hard to go cloth napkins also last year but failed miserably. We did it for 2 weeks and never went back! I did, however, do very well with my son’s no-waste lunches! I use these really cool vinyl sandwich bags we bought from one of his school’s fundraisers along with BPA-free plastic containers as well as a BPA-free plastic juice box. I’m so happy & proud to say we haven’t bought juices boxes for an entire year!!! I am also going to try to make our own healthy snacks in lieu of granola bars & crackers. Wish me luck! We still have a stash of paper napkins, but it should last most of the year since we mostly use cloth. They are stain-resistant so I don’t care if they get spaghetti sauce or worse on them. We have a pretty good stash of glass containers with lids for storing leftovers, so I’m not as tempted to put them in plastic bags. My oldest daughter is in 3rd grade and LOVES the idea of a no-waste lunch. She feels extremely proud if her entire lunch is without anything disposable. We pack reusable water bottles, cute small silverware (Pottery Barn Kids sale items), small cloth napkins in cute colors, and Itzy Ritzy Snack Happens bags for packing food. 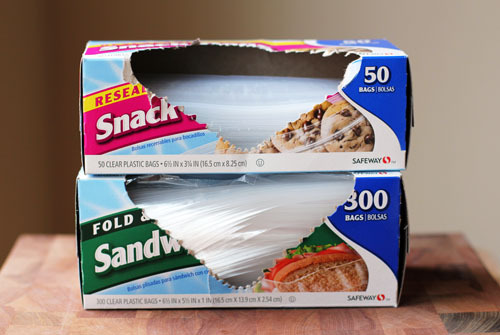 What I need help with is gallon zip-lock bags: when I shop at Sam’s Club I come home with a huge amount of bread rolls and baguettes and other breads, or large packs of meat that I freeze for later, but I don’t know how to store them in any way besides plastic bags. Any ideas??? I use cloth napkins for every meal. Buying the napkins can be very costly, but I buy mine at Goodwill. Most of the time I can buy 8 for less than $5.00. Over the summer, I bought 6 for a quarter! I have been trying to do this, too, but it is a lot harder than it seems, I agree! It’s such a little thing, but I always forget my reusable grocery bags. So that’s my first big resolution of 2013 — to remember them before we get out of the car! I bought great lunch containers at Target. They have a liquid filled long flat divider that can be frozenand separates the bottom half of the container from the top half, keeping the food cool. The bottom half is a large area that can fit a sandwich, or muffin-type foods. The top half, above the frozen divider is divided in half by two smaller boxes for side items in the lunch. The way it’s set up, nothing can ever get squished. I adore them and never use baggies. It’s kind of a large Tupperware with smaller ones inside it. I also got them larger vinyl type lunch boxes from Target with handles. The container fits perfectly inside it. Each is ten bucks…ten bucks well spent. This is such a hard one–making good packaging choices is the hardest for me. When the brand you really prefer has ridiculously wasteful packaging…a small change I’ve made is attempting to use less plastic wrap when storing food. I have a lot of glass storage, but sometimes I just want to store my leftovers in the bowl I made them in. Instead of using plastic wrap, I just put a plate on top of the bowl. And the bonus is then I can stack something on top of it. I LOVE lunchskins (www.lunchskins.com). They come in tons of cute designs and the quality is great. Best of all they are dishwasher safe. I have tried several reusable sandwich/snack bags but these are my favorite hands down. The only downside is that though the seal is good it’s not airtight like a plastic bag would be (none of the reusable bags are). If I pack a sandwich in the morning it’s still fine by lunch time but if I do it the night before it tends to dry out a bit (I live in a really dry climate though) and obviously things that leak need to go in tupperware. As far as cloth napkins go I recommend going to the craft store and buying some fun bandanas to pack in your kid’s lunches. They are much cheaper and come in really fun colors and designs. I have been so busy getting ready for the move I haven’t been able to respond to your comments yet, but I am LOVING them and love all the great ideas and links. THANK YOU!!!!! So I know I’m late, but we do cloth napkins Japanese restaurant style(think microfiber washcloth). When they’re damp it’s so much easier to clean up the kids faces. We also have a lot of bento boxes and Tupperware. All trash in lunch comes home, so I even use rewashable toothpicks for lunch. For family outings everyone gets a snap lock Tupperware, and I bring some bamboo silverware I got from Whole Foods. I still use plastic bags from time to time but its dropped a lot over the years. I like the idea of the reusable apple sauce pouches too. Our only issue is that everything here is packaged in plastic, at least it’s recycled, but still. Good luck!